We were recently approached by a long standing customer, Zircon Flooring Ltd., regarding the possibility of refurbishing an elderly machine. The oldest of their CT250 Planers was performing as well as ever but over the fifteen years of regular use it had collected a few battle scars and was looking a little bit tired. Zircon Flooring always try to present a clean, tidy, professional image and were mindful that some of their older equipment was falling below their high standards of presentation. The question was whether a machine that has worked hard and given good service could be made presentable and restored to perfect working order at a reasonable cost. We decided to investigate the possibilities. Would a small investment in time, parts and paint convert a tired fifteen year old machine into an “as new” machine with the potential to give good service for another five to ten years? The CT250 Planer was dismantled down to the last nut, bolt and washer and then all major parts were inspected for wear and serviceability. A small crack was found on the handle bar assembly that required welding. All other components were in surprisingly good condition. The motor and switchgear were the original items fitted from new and are probably good for another fifteen years hard use! The motor was cleaned, and resprayed while the switch gear was simply cleaned. Front and back wheels were worn and considering the low cost for replacements new ones were fitted. The bearings in the belt tensioning idler pulley were a little noisy and were replaced. The height adjustment handle was damaged and the threaded mechanism was not operating smoothly. Nothing that a few minutes in the lathe couldn’t sort out! The result was a height control system that worked as smoothly as the day it was first fitted. The drive shaft support bearing was replaced as the grease seal was showing signs of leaking. Far better to replace the bearing while the machine was stripped down, it is then a simple, quick, straightforward operation. We decided to shot blast and powder coat the main chassis and ancillary parts. Powder coating is a very durable attractive finish and for a small investment the results are outstanding. The photograph surely justifies this expense! The total cost of all replacement parts and the powder coating came to approximately £500. The end result surely vindicates the decision to go ahead with the renovation. 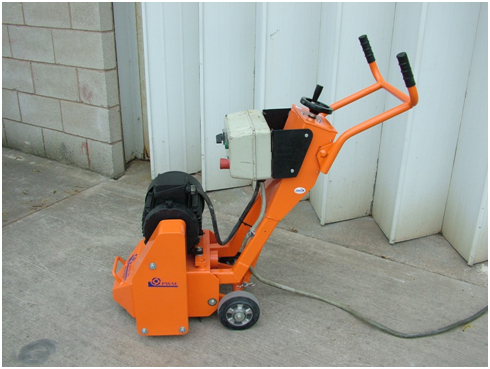 Zircon Flooring have a machine that will not embarrass them on site and rather than the wasteful option of scrapping a basically sound machine they can now look forward to many more years of low cost ownership. The question you must now consider is whether there is ever any justification for buying on price alone. Many times over the years we have lost sales for the CT250 based purely on price, usually the difference has been a few hundred pounds. How can saving a few hundred pounds of capital expenditure be justified over a life expectancy of fifteen plus years? A short time after finishing this project another good customer phoned with a similar request. He had a perfectly good Delta II grinder that was used regularly and was is perfect working order. His only problem was the machine looked tired and he was afraid his company was projecting the wrong image. Age of the grinder – fifteen years. Just about the entire machine including the motor and bearings were the original components. The drive belt, dust skirt and flexible couplings are the only spare parts that have been required during a very productive fifteen years on site. Austerity measures or not we can see a theme developing here…… As our grandparents have always told us “you get what you pay for”….. What price quality when it comes to investing in surface preparation equipment We will never have the lowest priced equipment but we are always happy to justify our prices and to back them up with low cost ownership and longevity.